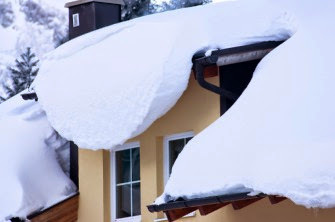 Trudel and Sons Roofing: How Much Snow Can Your Roof Handle? During a big winter snow storm people often are asked to stay inside and off the impassable roads. Your roof is then left to endure the elements and expected to keep you and your family safe... But what happens if your roof can’t handle the pressure? Here’s some information to share with your homeowners while they are stuck inside. When it’s safe to travel, contractors in the area or within driving distance have an opportunity to help homeowners repair an unsafe roof. Unfortunately, there are never any guarantees when it comes to the strength of a roof due to factors including: age of structure, age of roof, slope of roof, (in)effective roof installation, etc. In general, as much snow as possible should be raked off their roof, but leave a few inches to avoid damaging the shingles. Also, make sure the snow is thrown away from the building and be careful using metal tools around power lines. Contractors should advise homeowners to call their insurance company to see if they are covered in the event of a roof collapse. Call Trudel at (905) 642-3515 if you have any reservations about the condition of your roof this winter, we will provide you with peace of mind with our comprehensive roof inspection including a full detailed report on the condition and life expectancy of your roof.